A new NASA project called "AstrOlympics" is free for download and intended to help audiences build cosmic connections with the athletic feats they'll witness in Pyeongchang, Korea from Feb. 9 - 25. A free series of posters made by NASA is highlighting the truly out-of-this-world physics of winter Olympic sports. The NASA Chandra X-ray Observatoryis showcasing the physical parallels that Olympic athletes share with celestial objects. 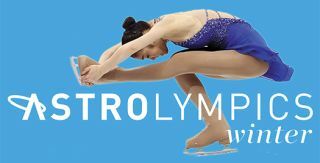 By checking out "AstrOlympics," space and sports fans can learn the commonalities between figure skaters and rotating pulsars, the similarities between ski jumpers and crashing galaxies, and what curling shares with the massive black hole at the center of the Milky Way galaxy. Physics of motion is the key to all of the amazing sports that audiences will witness during the 2018 Winter Olympics in Pyeongchang, South Korea, from Feb. 9 to Feb. 25. Each of the eight posters focuses on a topic of physics: speed, distance, mass, time, pressure, rotationand density. With this project, NASA is demonstrating that the universe is full of impressive ranges of these various physical properties. The materials are free to download, and additional information can be found on the project website. The Chandra X-ray Observatory is one of NASA's Great Observatories, a group that also includes the Hubble Space Telescope and the Spitzer Space Telescope. Chandra specifically targets high-energy sources in the universe, like black holes, supernovas and quasars. Scientists have used Chandra's capabilities to spot cosmic hurricane winds coming off a black hole, and even spotted a supernova turning itself inside out. Follow Doris Elin Salazar on Twitter@salazar_elin. Follow us@Spacedotcom, Facebook andGoogle+. Original article on Space.com.